On the other hand, hydroponics can also be incredibly simple, a hand watered bucket of sand with a single plant is also a method of hydroponic gardening. 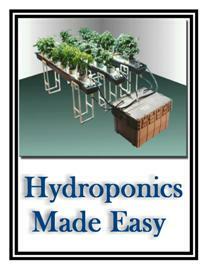 Most hobby oriented hydroponics systems are somewhere between the two extremes mentioned above. The "average" home hydroponic system usually consists of a few basic parts: a growing tray, a reservoir, a simple timer controlled submersible pump to water the plants and an air pump and air stone to oxygenate the nutrient solution. Of course, light (either natural or artificial) is also required. This 463 page PDF manual contains everything you need to know to get started in Hydroponics!